Video shows van driving on beach in Port Dover, Ont. A 43-year-old man has been arrested and charged with impaired driving after police say he drove a minivan onto a crowded beach in Port Dover, Ont. The incident was captured on video. 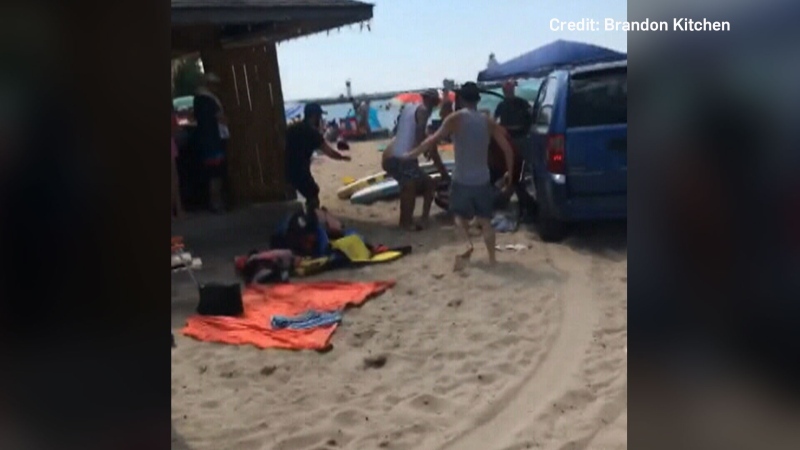 A 43-year-old man has been arrested and charged with impaired driving after police say he drove a minivan onto a crowded beach in Port Dover, Ont. A blue minivan can be seen in a cellphone video backing down the beach mere metres from people. The vehicle enters a parking lot, then mounts a sidewalk and drives back onto the beach, forcing people to dive out of its way. Bystanders can be seen pulling the minivan’s driver out of the vehicle. Eskarlin Calero says she began screaming and crying when she saw the van, thinking that her husband, Jose Hernandez, and daughter were underneath it. In fact, Hernandez was one of the people who stopped the driver. “He actually saved himself, he saved the rest of the people and he saved my daughter,” Calero said. Christine Ayala was also on the beach. She says her uncle stood in front of the van and demanded the driver stop. “(The driver) looked at them and shook his head like ‘no,’ like he wasn’t going to stop,” she said. Ontario Provincial Police Const. Ed Sanchuk said on Twitter that police received reports just before noon on Saturday that several people were struck. In fact no one was injured. “Thank you to the Good Samaritans that assisted by removing that male from the vehicle,” Sanchuk said. “I can guarantee you those people saved other people’s lives,” he added. Sanchuk said that the driver, who is from Stoney Creek, Ont., was “extremely intoxicated” and is facing charges including impaired driving, dangerous driving and breach of probation. The suspect’s name has not yet been released.